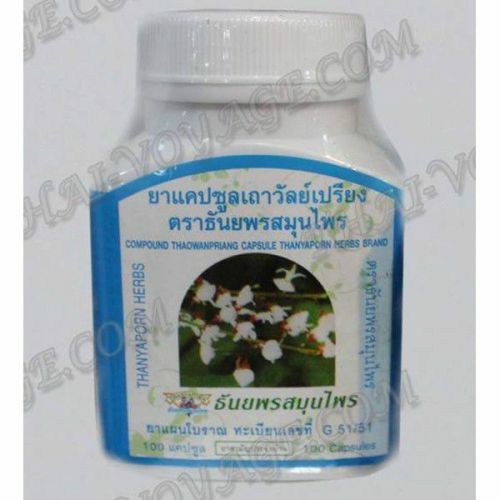 Capsules Taowanpriang - Thai folk remedy to normalize blood pressure and relieving muscle spasms. An indispensable tool for hypertension. Hypertension, hypercholesterolemia, high cholesterol levels in the body. Increased physical activity, intense exercise, limb numbness, muscle spasms. The drug normalizes blood pressure, improves blood circulation. Cleans the walls of veins and blood vessels from cholesterol, strengthens the walls of blood vessels, relieves pain and muscle tension, it is recommended for people with high physical activity and athletes. Each capsule contains 340 mg of Derris scandens Benth. Completely natural product! It does not contain artificial additives and colorings! Registration number: G51 / 51. Application: 2 capsules 3 times a day after meals.